I love the idea of food crawls – they’re not only a great way to meet other people, but they spotlight multiple establishments within walking distance of one another, thus promoting the neighborhood on a larger level. 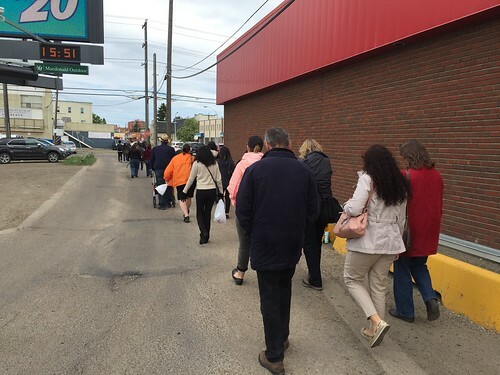 In the past, with the seemingly defunct Edmonton branch of Dishcrawl, the focus was on areas that were already mainstream – Downtown, Old Strathcona, 124 Street. In some ways, the food crawl is a more powerful tool when wielded to expose people to quadrants less ventured. Two years ago, the North Edge Business Revitalization Zone (covering Queen Mary Park and Central McDougall, just north of the Arena District) did this with their Flavour Journey Restaurant Tours. Now, McCauley Revitalization has embraced the food tour with a series called Stories Behind the Chopsticks. 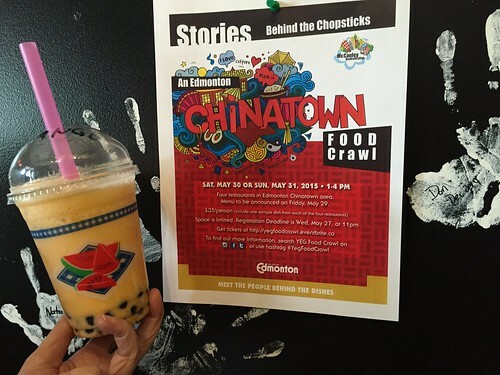 Led by Freya Fu, the tours have been a way for her to connect Edmontonians with an oft-overlooked neighbourhood: Chinatown. Plagued by a reputation of its high concentration of social services and housing, many dismiss Chinatown as unsafe and unwelcoming. 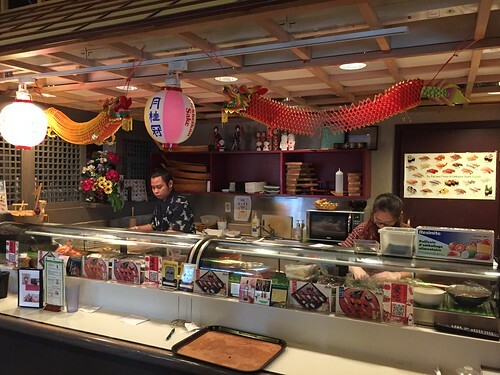 Those who do miss out on the gems – food stores like Ying Fat tofu factory and Shan Shan Bakery, happening late night hot pot restaurants like 97 Hot Pot and Urban Shabu, or my personal favourite, pho joints like Pho Tau Bay and King Noodle House. 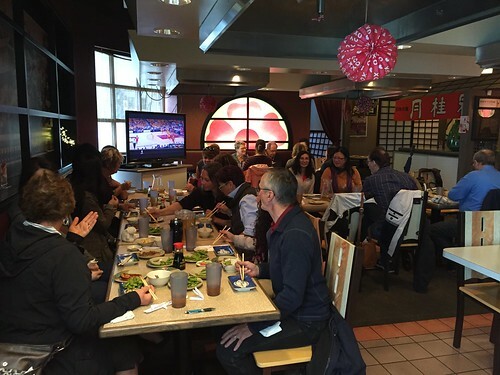 Freya established connections with several business owners in Chinatown to create four tours in May, each highlighting four restaurants. Two were open to the public, and the $35 tickets sold out in just a few days. 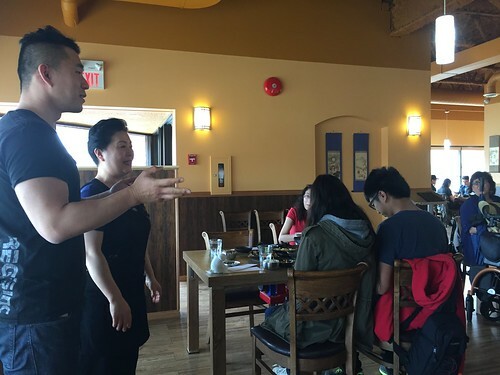 I have to say I was initially disappointed that the public tours were held in the afternoon (I think much of the stigma Chinatown has to overcome relates to its evening economy), but I also recognize the need to work with the owners at a time convenient for their regular customer flow. I had the pleasure of accompanying Freya on her May 30, 2015 tour as a volunteer. There were about two dozen people in the group who gathered at our first stop: Lee House (10704 97 Street). 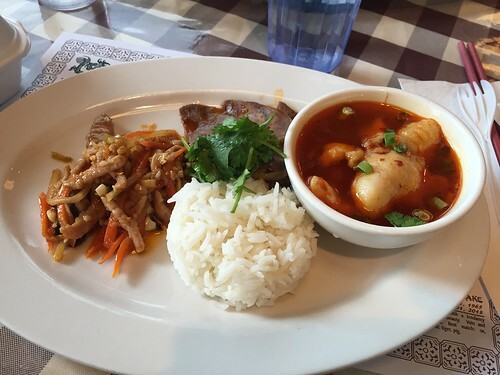 The second location of the southside Korean mainstay, proprietor Mrs. Lee shared that she had started the restaurant twenty-two years ago with her husband. She was clearly very proud of her scratch cooking, and her son shared that she was particularly excited about this branch because of its proximity to the Lucky 97 Supermarket across the street, allowing for easy access to fresh ingredients. 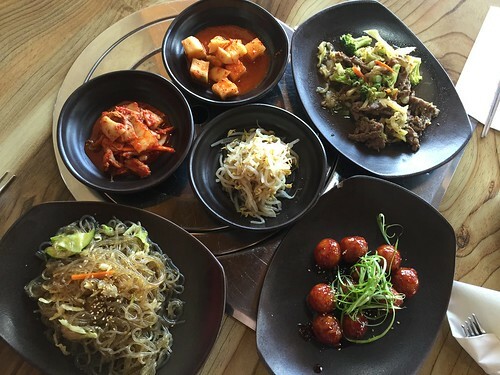 We were treated to a family-style feast, including bulgogi, japchae, chicken balls, and an assortment of pickled accompaniments. The japchae (stir fried sweet potato noodles) is a favourite of mine, and the Lee House version doesn’t disappoint. Zen Sushi (10518 101 Street) was the second stop. I confessed that I had walked past the storefront on 101 Street countless times, but had never peeked inside. Henry, the owner, grew up in the neighbourhood, and expressed his commitment to help grow and develop McCauley. He intends at some point in the future to start “Zen After Dark” where their usual all you can eat concept will be set aside in favour of a special ramen menu on Friday and Saturday nights. This would help drive foot traffic in the area and he hopes to make Zen a positive destination. I’m not a sushi eater, so I didn’t partake in much at this stop. Zen also had some kinks to work out in their ordering system for a group our size, but I’m certain they would have streamlined it by the second crawl. Next, we headed to the adjacent Golden Szechuan (10508 101 Street). Specializing in regional Szechuan cuisine (known for its unrelenting heat), we were served a beautifully plated sampling of dishes: shredded pork with Szechuan sauce, sliced beef tendon in spicy sauce, and my favourite, sliced fish in hot sauce. It would have been ideal for the owners to provide more of an introduction to the cuisine, as I was certain many would have benefited from learning about what separates Szechuan cooking from other, more familiar, Chinese styles. Before dessert, we made a quick stop at Ruby’s Bakery (10642 98 Street) to pick up some treats. 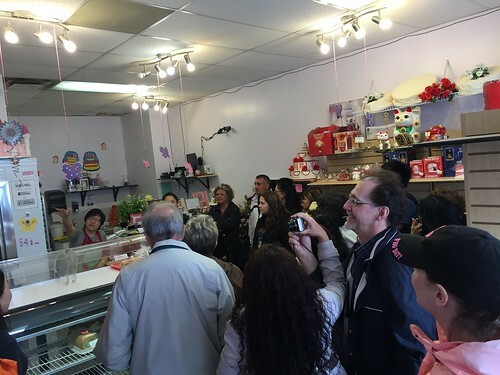 How many people can fit inside Ruby’s Bakery? Offering Hong Kong-style baked goods, including elaborate wedding cakes, it was difficult to ignore the wafting aromas of freshly made sweets. 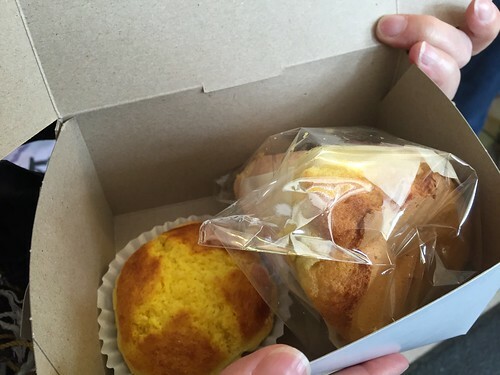 The coconut tarts were such a hit that some tourgoers ended up purchasing more to take home. With our to-go boxes in hand, we ambled next door to Tea Bar Café (10640 98 Street), one of several Chinatown establishments serving up bubble tea. An alternative to coffee shops, the blended fruit-based drinks with tapioca pearls proved to be a refreshing way to end our journey. Similar to Golden Szechuan, I would have appreciated some more information from the owner about the history of bubble tea. Overall, from conversations with participants, most had never been to any of the establishments prior to the tour. Many said they would return on their own, now knowing what to expect. Freya had the ingenious idea to distribute a coupon book offering deals to each of the businesses, which will hopefully further encourage repeat visits. Thanks again to Freya for the opportunity to join her on the tour! And if you missed it, you’re in luck – due to popular demand, a second tour, featuring different restaurants, is taking place on July 15, 2015 at 6:30pm. The link to the tickets will go live on July 2 at 7am.